Although somewhat unkindly intonated, this account, together with the very aggressive timeframe (18 months – but it ended up slipping by 3 months) for getting ‘Bounty’ to market, helps to explain why Acclaim so closely followed the design of Ballade. Design sketches by Gordon Sked of BL’s Styling Services department dated January 1981 demonstrate that its designers at least hoped to have opportunity to distinguish their car. Interestingly, Honda updated the Ballade in 1983 with a restyle that owed a remarkable amount to Sked’s sketches, but BL did not take advantage of the same changes – it’s probable that it didn’t want to incur the costs related to such an exercise. If BL was to make little impression on the aesthetic of its new car, the production of that car was to have a profound impact on BL. What was to prove to be, perhaps, the most impressive aspect of the Acclaim (and benefit to BL) was not immediately obvious to the eye: build quality and reliability. Apart from the politics and employee relations issues surrounding it, BL was probably best known at the time for the poor reliability of its products. It bordered on being a public joke. So, the Guardian was somewhat generous when it printed an article headlined, “Cowley Wizard will Head Honda Tie Up”. The piece concerned Andrew Barr, “who ran BL’s Cowley assembly plant while it became one of Leyland’s most successful factories” and had thus been promoted to be manufacturing director for BL’s Rover-Triumph Division, and in turn had landed responsibility for “the British version of the new Japanese Honda car”. Of more relevance, reference is made to the fact that, although Cowley had broken productivity records (within BL), was less trouble prone than the plant at Longbridge, and had regularly achieved more than 100% of the programmed output, Cowley was only approaching “Continental” levels of productivity. Moreover, “the time taken to build cars … is not yet up to European standards”. Put another way, at that time, being acclaimed as the most efficient factory in the Leyland empire was to be damned with faint praise, and comparisons with the performance of peers in the EEC (as it then was) were similarly unambitious. Furthermore, productivity and time-to-build did not talk to quality. BL needed a quantum leap in all three areas: the Acclaim and Honda gave them the opportunity to learn of, and develop, all three. Japanese manufacturers, with their integrated, multi-disciplined, new product development project teams, ‘just-in-time’ component supply and delivery approach, lean-manufacturing techniques, experience of automated assembly, and extreme approach to managing component quality to extremely tight tolerances, were masters of product development and production engineering. A BL development engineer of the time comments “I worked on the Bounty development team at Longbridge and Gaydon [which was the development centre for BL Cars]. One of the first things we did was get rid of the adhesives used in the body in white construction. This ruined the durability of the vehicle on the Belgian pave durability cycle at MIRA. Lesson learned, the ‘unnecessary’ adhesives were reinstated. The body shells when built as Honda intended did twice the mileage that BL engineered products could endure on pave, at which point we declared them effectively unbreakable. So it seems that, in the case of the Acclaim at least, BL people came to accept Honda’s standards. It’s notable that Car Magazine’s feature article on the Acclaim’s launch focused on the investment that BL had made (using tax-payers’ money, agreed as part of the Government’s acceptance of the 1980 Corporate Plan) in the Cowley plant. Acclaim body-shells shuffle down the production line. The article, which is dominated by pictures of skeletal Acclaim bodies in various stages of assembly in a thoroughly modern-looking plant, emphasises how the £70m investment in ‘modernisation’ at Cowley had been spent on five main areas of production: stamping, body framing, assembly, paint and testing. It’s reported that the steel and production of the panels was almost entirely British, providing the vast majority of the 70% British content claimed for every Acclaim (this was important, not least because it enabled to Acclaim to be sold outside of the ‘gentlemen’s agreement’ of an 11% quota for Japanese cars in the UK at that time). The article’s author, Steve Cropley, notes that “the labels on the robots say ‘Honda Engineering’”, and there’s a whole section of the text explaining how the £30m new paint shop included state of the art solutions to deliver the highest quality finish. The advertising agency wanted to recapture some of the fervour of the miniMetro’s launch of the previous year, and the poster did reflect a sense within the company that the Acclaim gave BL a second new model of which it could be proud, and, more importantly, which would enable it to stem and even reverse its shrinking market share. BL hoped to build and sell 80,000 cars a year and set up its production facilities accordingly. Next time, I might actually write something about the car itself, and reveal more about LJKS’s surprisingly positive thoughts about it. I hope this series will continue, as BL and Rover continued its Honda association throughout the 80s and into the 90s. One question though: is it true that Honda brought ‘just in time’ manufacturing to the UK? My understanding that this technique, also known as ‘the Toyota system’, came to the UK and the wider world a bit later. It was really a dedication to quality that marked out Japanese manufacturing at the time, and the concept of ‘continuous improvement’, where the defects picked up by the quality assurance guys at the end of the line were fed back along the factory until a solution was found. I remember with great fondness those ‘OK’ stickers with a big tick that used to feature on Japanese cars… providing much reassurance to customers. Hi, and thanks for the question. To be honest, I think I may have got a little carried away and applied my brush rather expansively with that line. I need to check the time-frame of ‘just-in-time’ and you are probably right in your comment. I was making a broad point about how vital the injection of Japanese development know-how – of both the vehicle and the production engineering – was to BL at the time, and I feel BL and Edwardes in particular deserve some recognition for swallowing some national and personal pride for accepting this. These were strange times for UK PLC and its car makers in particular where it was having trouble accepting the truths of just how poor it was in many aspects of engineering. The rise of Japanese marques really punctured the balloon of the UK management cadre and many of them were angered at suggestions that Japanese standards were far superior. Alongside the Japanese manufacturer’s documented superiority in build consistency (not to mention accuracy), another notable trait was the attention they paid to control weighting; not only across the various controls of a single vehicle, but from one car to the next. Having worked within a car leasing / rental business during the late 1980s, I gained intimate experience of a considerable number of Japanese vehicles, alongside their European rivals. What was quite notable even then was the Japanese manufacturer’s attention to detail in creating a relaxed and utterly consistent driving environment. The European marques were improving, but still well behind in this area. I do think this played a huge role in cementing their appeal to the paying customer. The motor press criticised them for a lack of ‘feeling’, yet it was this very trait which probably made them so accessible to drivers of all abilities. They were not ‘driver’s cars’ by any stretch, but neither were the bulk of the mainstream Euro-cars at the time either – (with one or two notable exceptions). In 1981, the Acclaim must have been a revelation, but only to those who had never driven a Japanese car before. You make a great point. For example, when I was a kid, my parents bought a brand new, ‘Miracle’ Maestro which, on driving it home, very proudly, from the showroom suddenly refused to engage anything but second gear. Fortunately, we were able to nurse the thing back to the garage to be sorted – you can imagine how disappointed we were. To cover for the loss of the Maestro whilst it was being fixed, the garage lent us an Acclaim. It was very cramped inside in comparison, and of course I never drove it, but my step-father, who had never driven a ‘Japanese’ car before, thought it terrific to drive (most especially the zip of the engine and slickness of the gear-change), and not just because it actually worked! If it had been bigger inside, I know he would have negotiated a swap to the Acclaim from our stricken Maestro, which never fully recovered in many ways from that Day 1 disappointment. I also had the opportunity to compare an Acclaim back-to-back with a “proper” Austin Rover car, in my case a Montego. I had one of the latter as a company car back in 1984. It was an early 1.6L model. My next-door neighbour bought a new Acclaim at the same time. I have to say the Montego was the nicer car to drive, but otherwise was markedly inferior to the Acclaim. The build quality was, shall we say, approximate: shut line gaps were all over the place, doors and boot closed with a nasty “clang”, the black paintwork had the worst “orange peel”I’ve ever seen and the brittle plastic bumpers self-destructed at the slightest provocation. (A mechanic allegedly dropped a spanner on the front bumper during the first service and punched a hole in it. The back bumper cracked from end to end when somebody nudged it in a car park.) Within a year, the thick plastic external door cappings (designed to hide the falling waistline on the Maestro sourced doors, apparently) had all warped and were misaligned thereafter. All that said, the Montego never broke down in the two years I had it, although it felt pretty “baggy” and loose after 30k miles. The Acclaim, by contrast, was very precisely built and felt way ahead in terms of quality, even if it was cramped and the styling rather twee. My neighbour was sufficiently impressed to replace it with a Rover 213. My Montego replaced a Datsun Bluebird, which my predecessor had chosen and then driven into the ground. (I wondered if he had been moonlighting as a mini-cab driver.) Notwithstanding this, it still drove well and felt tight and well put together, even at 80k. 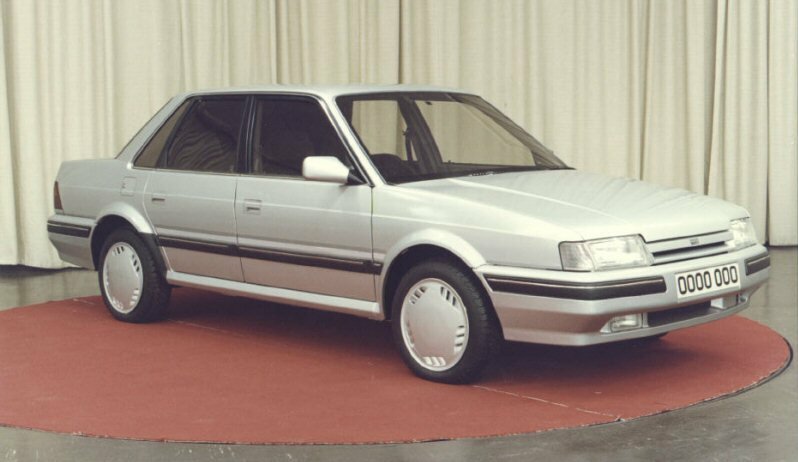 The comparison between the Montego and the two “Japanese” cars showed that Austin Rover still had a lot to learn about designing quality into their cars. They did learn, however and enjoyed a purple patch in the 1990’s before the sale of the company to BMW. Had they merged with Honda instead, who knows where they would be today. Yes, I have seen that too before on the excellent AROnline. Roy Axe famously detested the Montego when he first saw it, telling Harold Musgrove to bin it and start again, but that was never an option. The 600 you depict looks like what he might have liked to have done with it, ridding the car of those awkward but distinctive sixth windows. AROnline is full of quite nice but depressingly never built what might have beens from BL/ ARG, etc. Some of the Metro replacements, for example looked advanced and interesting. I wish Rover had stayed with Honda. They seemed to work well together and complement each other; some of the Rover versions of the products they produced even sold better than the Honda versions. However, Rover’s owner, BAe, wanted to offload them ASAP and Honda didn’t want to take a majority share. BMW was cash rich, and was prepared to do so, so that was the end of that. My actual Dad had two Montegos – an early-ish 1.6L (having had a string of Ford Cortinas over many years as company cars, he was put off by the Sierra and the recorded issues about minor knocks leading to write-offs) which was replaced by a (much) later GTi, which was one of those facelifted models which lacked a marque badge given that Austin had fallen out of favour and ‘ARG’ became just ‘The Rover Group’ under Graham Day. That first 1.6L had all the early quirks, including the weird mayonnaise-like, emulsion that appeared in the oil filler tube, and aged in a similar way to yours – super-fragile plastic rear bumpers, warped plastic door-top caps, etc. The GTi was much better built, showed evidence of continuous improvement in the way aspects of the car had been developed in terms of refinement, and had the gruff if torquey 2.0l ‘O-Series’ EFi lump from the MG models. I remember he really liked this car, with an excellent chassis, nice steering and quite a lot of stonk from that engine. Others obviously liked it too because it was stolen and found later crashed to the point of being a write-off by someone having more fun than ability to hold it together on a country road. This could have been the first Rover 600. Another opportunity missed?